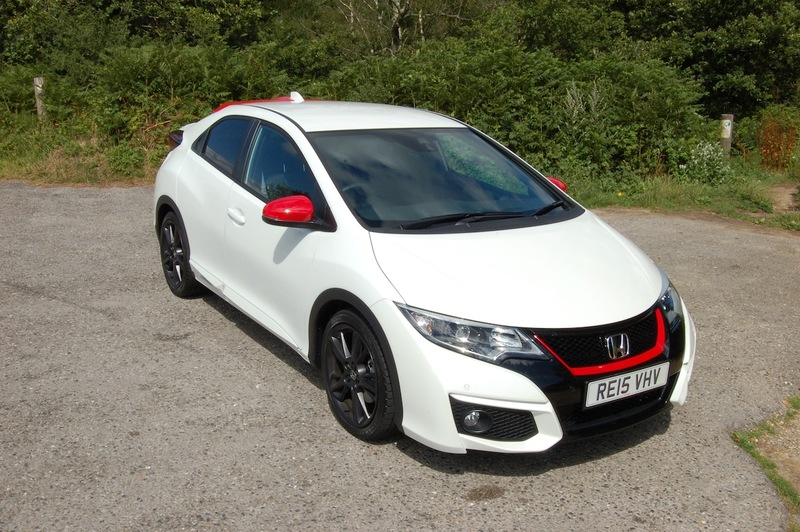 Civic Pride… Kim Henson assesses Honda’s 1.8 i-VTEC Sport version. Dynamically styled, providing eager performance and with an excellent, proven reputation for reliability, it is no surprise that Honda Civics are liked and respected by the buying public. The current Civic range was updated in the spring of 2015, notably featuring revised frontal styling (incorporating a new front bumper assembly and headlamps with built-in daytime running lights), all-new suspension plus a variety of active safety systems. These include, for example, revised electrically-operated power steering, enhanced Agile Handling Assist and Vehicle Stability Assist systems, plus Honda’s insurance company-friendly City-Brake Active technology – designed to apply the brakes automatically if required, at speeds less than 18 mph. ‘Agile Handling Assist’ – designed to enhance stability and responsiveness, automatically applies a small braking force when needed, to the inner wheels when the steering wheel is rotated, and to the outer wheels when the steering is returned to its centre (straight ahead) position. Working in conjunction with Agile Handling Assist is a revised ‘Vehicle Stability Assist’ system, to optimise traction when cornering or accelerating on slippery surfaces. (Importantly, the Civic carries a ‘5 star’ (i.e. very impressive) EuroNCAP safety rating). For those wishing to take advantage of further modern technologies to enhance and make safer the Civic driving experience, there’s a wide range of optional systems, available at extra cost, individually or all together as part of Honda’s ‘Driver Assistance Safety Pack’. 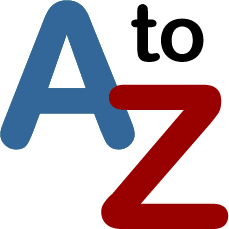 These include (as examples), ‘Forward Collision Warning’, ‘Traffic Sign Recognition’, ‘Lane Departure Warning’ and many others. For all versions there are upgraded interiors and (on the hatchback versions) a revised appearance for at the rear end of the car, incorporating fresh styling for the bumper and side skirts, a black-finished spoiler and LED combination lamps. With the exception of the range entry level ‘S’ designation model, all Civics feature a new, intuitive Android 4.0.4-based Honda Connect audio/infotainment set-up (incorporating a seven inch display screen). 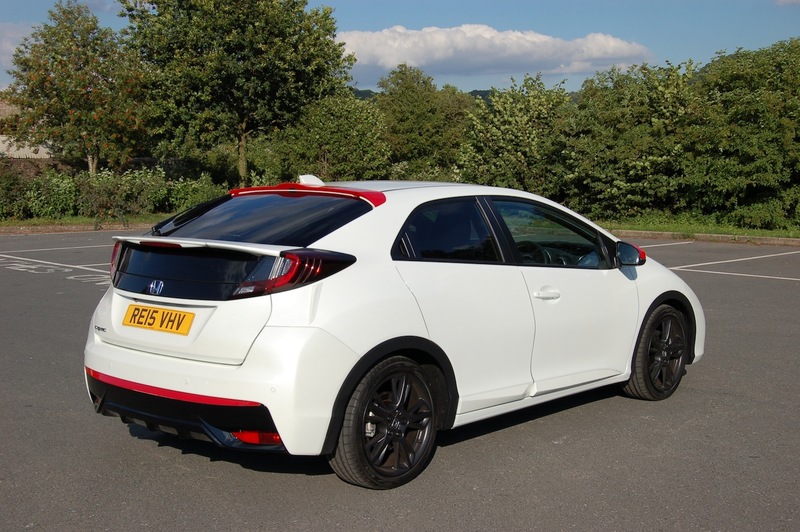 The features of this system included within the standard specification of each Civic version vary according to the specific model chosen, so if you are thinking of buying a Civic, it’s wise to work out in advance exactly what you need and expect for your new car. For example, a Garmin satellite navigation system and CD player (together) come as standard only in the higher specification SR and EX Plus models, and are optional in SE Plus and Sport versions. By contrast, a CD/tuner is found in the entry-level S model, but this is not part of the Honda Connect system. Confused? 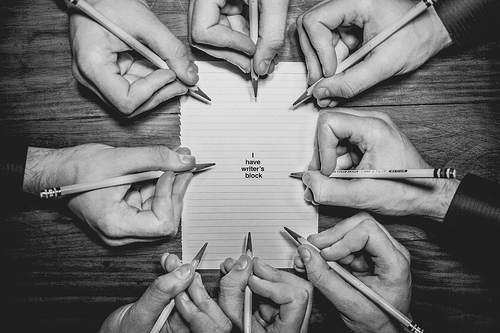 Yes, we were too. It’s worth noting that the ‘full’ version of the Honda Connect audio and information system provides AM/FM, DAB and internet radio functions, Bluetooth connectivity, satellite navigation, internet browsing and a rear view parking camera. From the launch of the latest 2015 models, a new addition to the line-up was the 1.8 Civic Sport, available with a 120 PS, 1.6 litre four cylinder diesel engine, or a 142 PS, 1.8 litre four cylinder petrol motor – this being the version under review here. The sleek Sport version, derived from the hatchback Civic, features some of the design cues applied to the ultra-rapid Type R model, and is identifiable by its lower mesh grille, 17 inch Sport design aluminium alloy road wheels, its unique colour-coded rear spoiler, and its black interior headlining. Among other goodies, it also provides buyers with aluminium alloy control pedals, privacy glass for the rear side and tailgate windows, dual zone climate control, a cruise control set-up incorporating a speed limiter, front and rear parking sensors plus a rear view camera, and remote control electrically-operated windows. I covered approximately 520 miles during a week spent with the 1.8 litre petrol version (‘i-VTEC’) of the sleekly-styled five door Sport, powered by Honda’s refined four cylinder 1798cc engine, developing 142 PS. The ‘VTEC’ part of this model’s designation indicates that the engine incorporates Honda’s famous and well-proven ‘Variable Timing and Lift Electronic Control’ system for improving power and emissions from their engines. The ‘i-VTEC’ system varies the opening of both the inlet and exhaust valves according to driver demands/engine speeds. 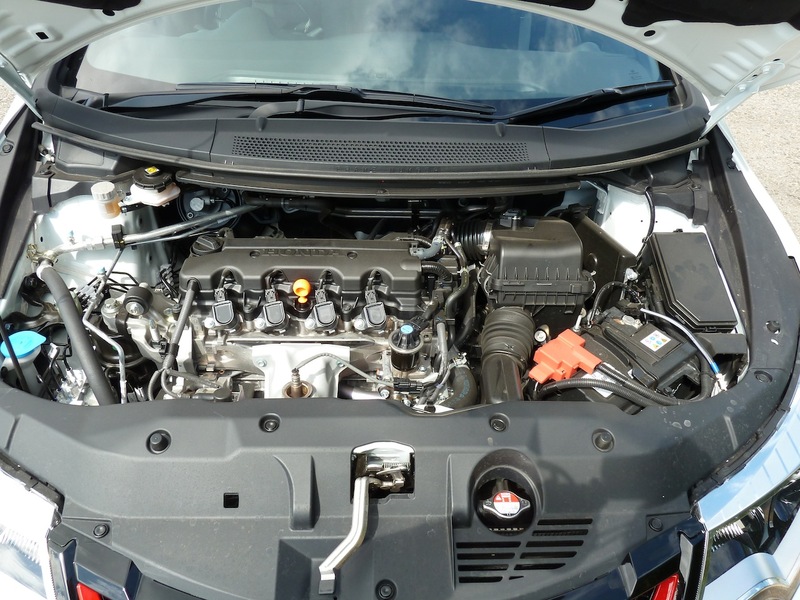 Willing, refined, and eager to perform – Honda’s sophisticated four cylinder 1.8 litre petrol engine.I discovered that this 1.8 litre power unit delivers its performance willingly and without fuss, driving the front wheels via a six speed manual gearbox – which features a delightfully slick gearchange. I discovered that this 1.8 litre power unit delivers its performance willingly and without fuss, driving the front wheels via a six speed manual gearbox – which features a delightfully slick gearchange. Cruising at high road speeds in the test car was enjoyable; at 70 mph in top (sixth) gear the engine is turning at an effortless and hushed 2,900 rpm. As easy-to-assimilate cruise control system is fitted, and I found this easy to operate. I was also impressed by the very clear foglamp controls (stalk-mounted rotary types) and the conventional handbrake lever – it was easy to reach and to use too. The Wheels-Alive test team found that the comfortable interior provided reasonable leg and head room for rear seat occupants (as well as plenty of space for those in the front), and over long distances there was nothing but praise from all occupants about the car’s refined ride quality. Favourable comments were also made about the twin 12 volt sockets incorporated within the centre console assembly, the USB and HDMI sockets (for those who may not know, that means, respectively, ‘Universal Serial Bus’ and ‘High Definition Multimedia Interface’) also featuring here, the deep central compartment with lift-up lid and the two spring-loaded cup holders in the same vicinity. 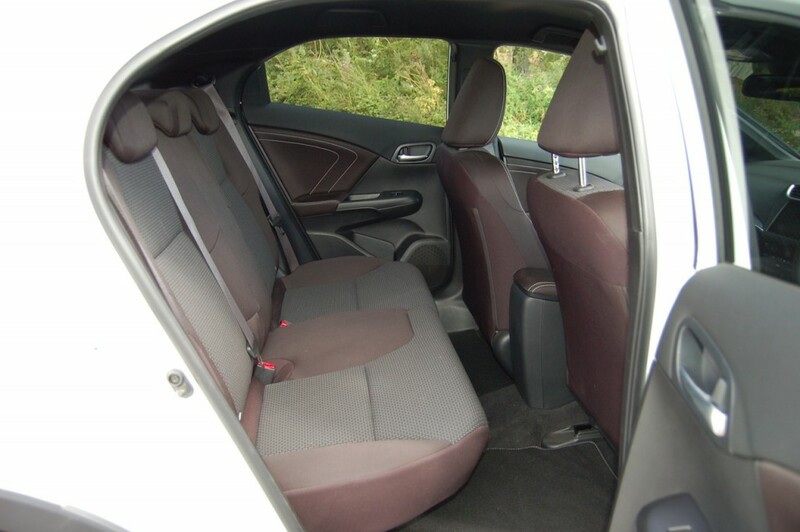 Reasonable head and leg room in the rear – but leg room is not great with the front seats set towards the rearmost positions on their runners. From a driver’s point of view, I revelled in the fact that the Honda was fun to drive in a spirited fashion where the roads allowed; the vehicle handled superbly and felt sure-footed and safe (with excellent braking too) in all situations we encountered, from motorways and fast ‘A’ roads to twisting country routes in the border counties of England and Wales. The Sport was also pleasant to drive and easy to manoeuvre in town, although the high rear quarters of the car reduced rearward visibility when reversing. (Having said that, of course the car is provided with front and rear parking sensors, plus a rear view camera!). Notable positive aspects of the interior, as highlighted by the Wheels-Alive assessment team, are a height-adjustable driver’s seat, multi-function steering wheel mounted controls, long, deep storage bins in the front doors (plus shorter ones in the rears), the provision of a grab handle over each of the four passenger doors, twin map reading lamps (as well as the main interior light), and – a very nice touch – the word ‘Civic’ embossed into the front door sill covers, and illuminated in blue light from below! Very swish. 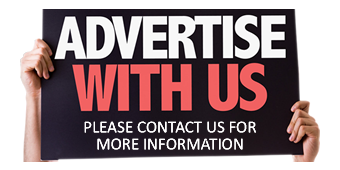 The facia is well thought out, and comprehensive in its coverage. In addition to the multi-function Honda Connect screen, there are coolant temperature and fuel gauges, plus a tachometer (redlined at 6,700 rpm); there’s also a large scale digital readout of the car’s speed, projected at the top of the dashboard so that it is instantly, easily, unmistakably and always visible to the driver. Clear instrumentation – including a digital dispaly for road speed, at the top of the dash. The car’s on-board ‘trip’ computer provided useful information displays – easy to read, day and night. I found that the car’s on-board computer displays, providing information such as petrol consumption, available range on the remaining fuel, etc, were clear and easy to read in the daytime and at night. A push-button operated ‘Economy Mode’ brings into play the useful illumination of self-explanatory green arrows on the dash. 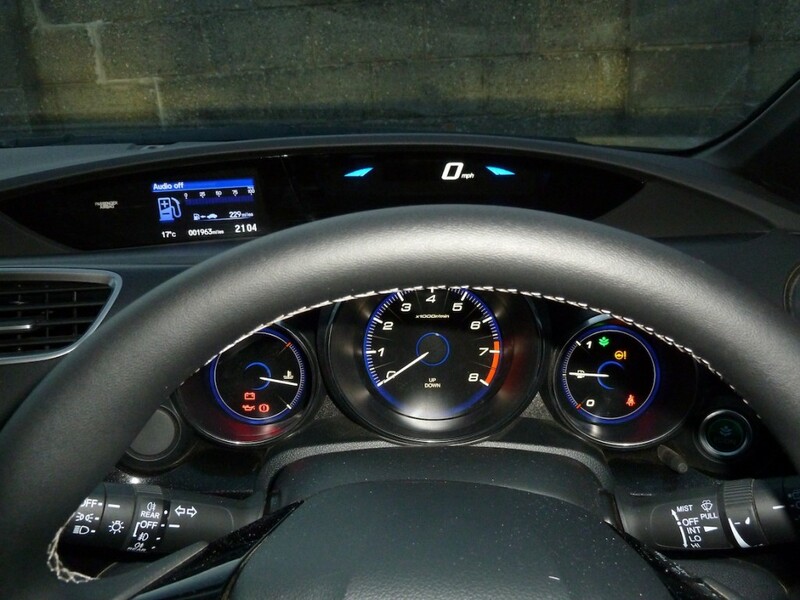 Illuminated coloured ‘segments’ on either side of the digital speed indicator at the top of the dash shine in blue (for ‘normal’ motoring) and green (for ‘economy’ operation). While on the subject of economy, the official ‘Combined’ fuel consumption figure for the Sport is 46.3 miles per gallon. 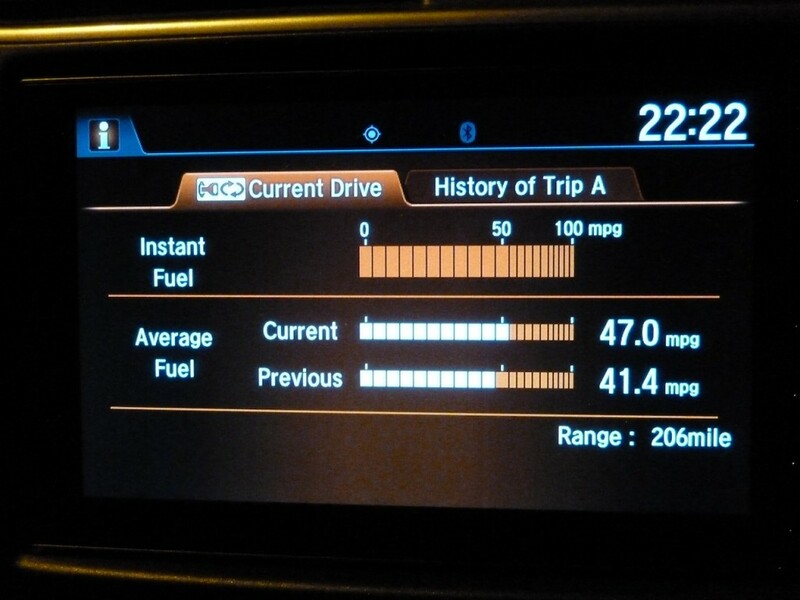 In fact, personally I feel that 47 mpg is easily attainable with a little care, although my actual ‘brim to brim’ true consumption with a full load of passengers, over one 240 mile trip, worked out at 37.19 mpg. While this is less than the ‘official’ figure, to be fair this was achieved over real, often very busy roads, and included hilly terrain where much gearchanging was required, also queueing in slow traffic for some miles. On other separate runs I achieved up to 43.8 mpg without trying at all. Our test car was equipped with optional (at an extra cost of £995) 18 inch black-finished aluminium alloy ‘Nitrogen’ road wheels, which looked wonderful but it’s worth noting that if these wheels are specified the rims protrude beyond the tyres, so even just touching a kerb when parking will scratch the wheel. Optional ‘Nitrogen’ sports wheels on the test car – lovely looking but the rims protrude from the tyres, and thus are easily scratched. 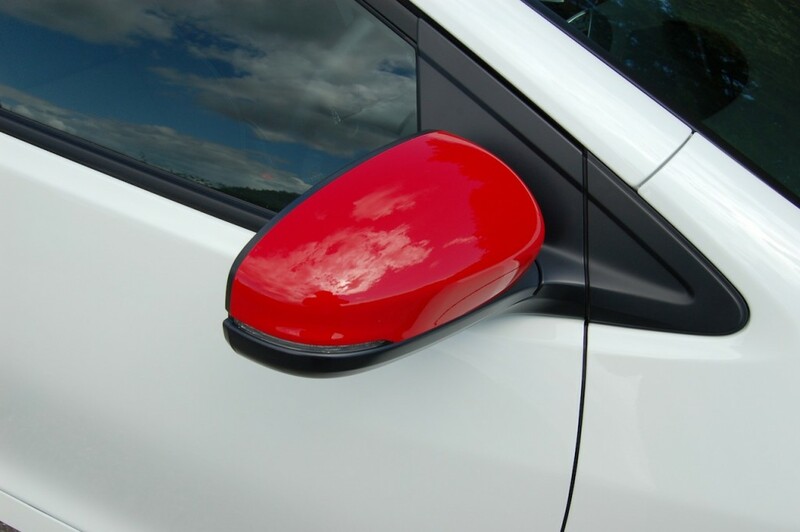 Red highlights on our test Civic included the door-mounted mirrors. The excellent boot is very definitely worthy of mention. 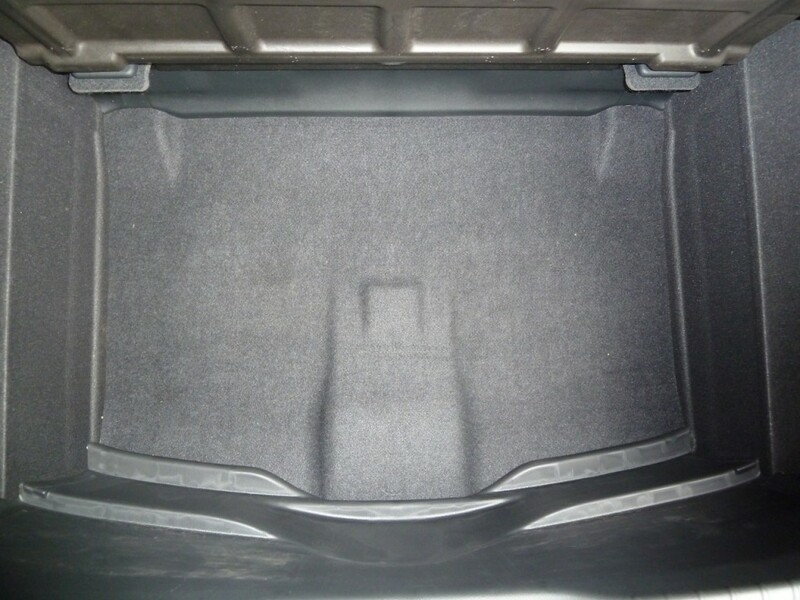 It is deep, wide and long in proportions, and beneath the lifting centre section of the luggage compartment floor is found a separate, deep, handy and generously-proportioned compartment (the downside is the lack of a spare wheel). In addition there’s a built-in strap in the left-hand rear corner of the boot (which I found perfect for securing a camera, etc.). 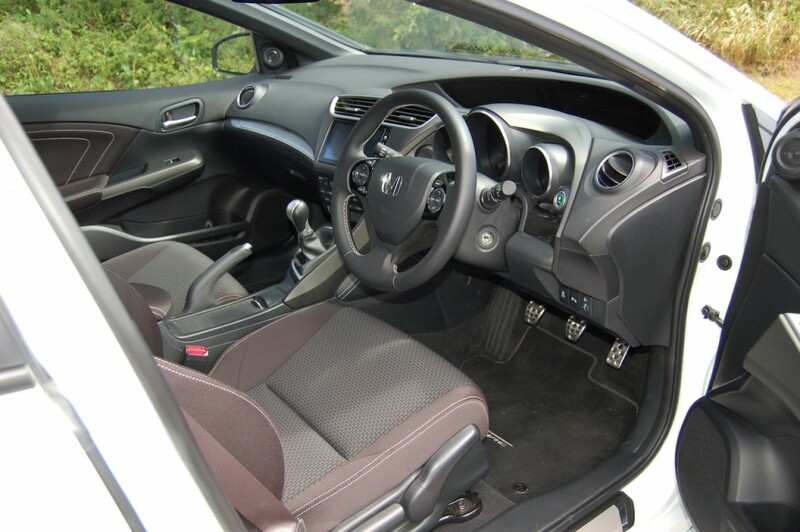 The rear seats (‘Magic Seats’, as described by Honda) divide on a one third to two thirds basis. Importantly, as the seat backrest folds (easily and quickly activated by buttons on each side of the backrest), simultaneously the seat base section moves forwards, resulting in the instant creation of an excellent, near flat load floor. This brilliant system is simple and easy to use (especially helpful if you need to change the seating configuration when it’s raining, for example). The boot is long, wide and deep; the only drawback is a fairly high load sill. 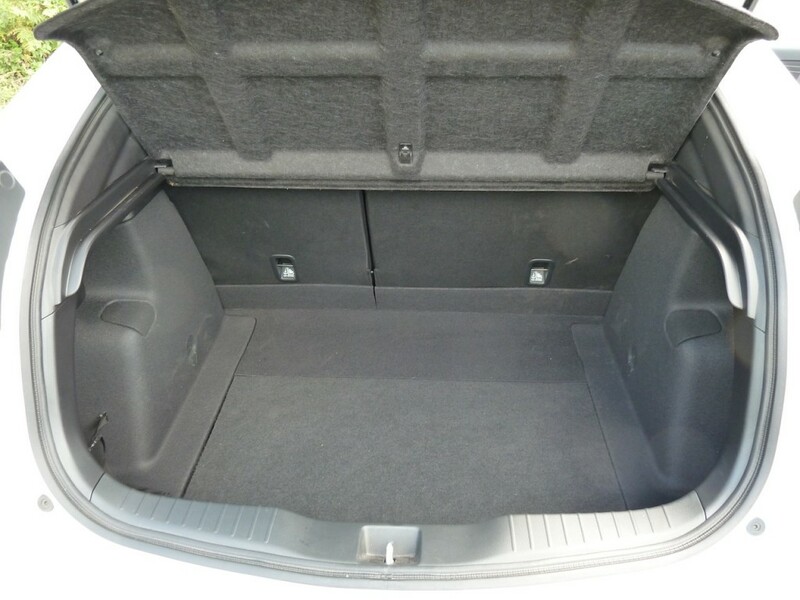 There’s a useful separate storage compartment beneath the main boot floor. 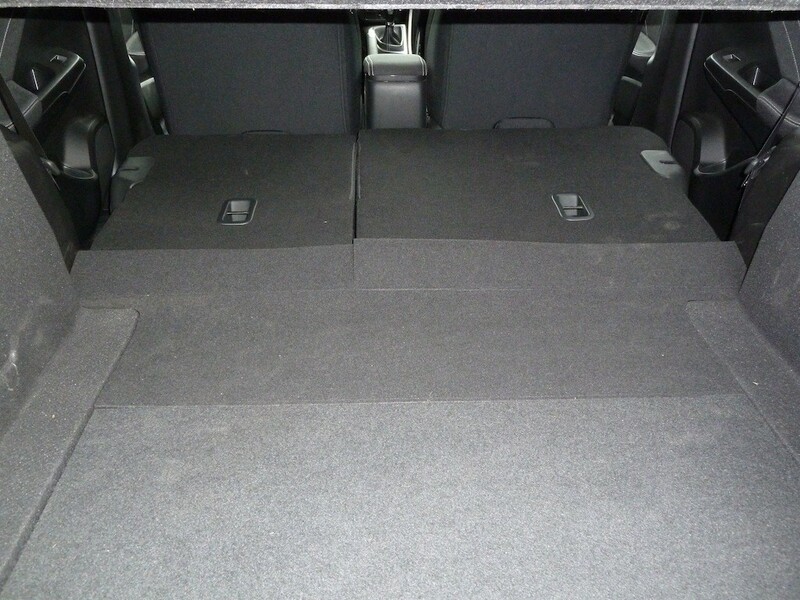 The rear ‘Magic Seats’ fold easily to provide a flat-floored load area. Brilliant! For the record, Honda says that the capacity of the luggage compartment is a generous (and class-leading) 477 litres. To most of us that translates into ‘very spacious’! That’s great but the rear load sill is quite high, so the loading/unloading of large/heavy items can be challenging. A marvellous, enjoyable, well-built machine, that’s practical yet good-looking – perhaps one of the most dynamically-styled cars on the road today – and great to drive too. 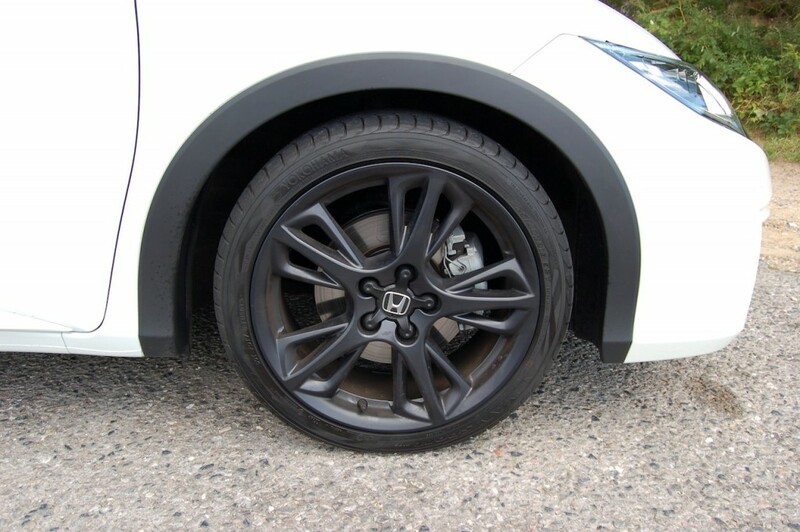 PRICE (‘On The Road’): £19,615 (extras fitted to our test car included Pearlescent Paint, costing an additional £525, plus 18 inch ‘Nitrogen’ aluminium alloy wheels, listed at £995, and making the total cost of the vehicle as tested to £21,135).